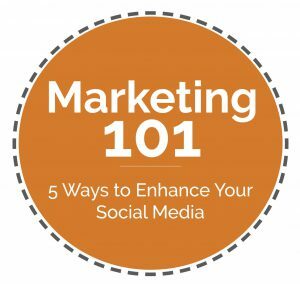 We cover tips for enhancing your overall social media presence in our Marketing 101 blog series here. You’ll want to keep those tips in mind as we take a deeper dive into the perks of promoting your organization on LinkedIn. We know there are many social media platforms you can use to promote your work. It quickly gets overwhelming when you try and keep up with everything. We recommend choosing 1-2 platforms to engage with your targeted audience (whether that’s donors, clients, etc. ), and do those really well. 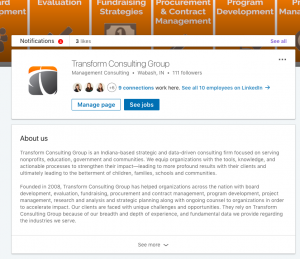 We are big fans of LinkedIn at Transform Consulting Group, and we choose to invest time and resources into connecting with our audience through this platform. Why? For TCG, LinkedIN is where our target population is spending time and the best use for our efforts. It will vary depending on your client audience. For example, if your audience is younger, then Instagram or Twitter might be a better fit. LinkedIn also relies on staff and employees to help promote the organization’s presence. Because our team works across the state, we often have colleagues attending different events or meetings. Our team is on the go, and LinkedIn is a great platform for everyone to share what they are learning and doing related to TCG. To ensure that we are best leveraging this platform, we follow these 7 practices and think you should too! Add Visuals – When setting up your organization’s profile, include your logo and a cover image on your organization’s page. Your logo appears when members search for you as well as on your employees’ profiles. Research shows that companies with logo images get six times more traffic to their pages. Be Consistent – When we talk about consistency, we’re talking about two areas: 1) in the content posted and 2) in the way your staff engages online. As with any social media content or marketing effort, it is important to stay true to your brand (check out tips in this blog). Your content should be relevant to your work and the sector you serve. Share articles and reports that are related to your cause. Snap photos of clients and share your story of impact. Always remember who you’re targeting to determine if the content is relevant and appropriate. Consistency also applies to your staff because LinkedIn really encourages “networks.” As mentioned earlier, this is what makes LinkedIn work. The way to expand your network is by having staff link their personal profiles to your organization’s page. One of the first things we do at TCG when we have a new hire is share step-by-step instructions for adding their new position with our company to their personal profile. You can search any of our staff and you’ll find consistent language explaining TCG and our work. Because everyone is expected to link our organization page in their work history, we want to make sure that their networks are getting an accurate picture of who we are. If you do a quick scan of your employee’s LinkedIN profile, are they all consistently and accurately explaining your organization? If not, then this is an opportunity to strengthen the branding and awareness of your organization. Add this step to your staff orientation checklist! Optimize for Search – Company pages on LinkedIn are search engine optimization (SEO)-friendly. Google previews up to 156 characters of your page text, so fill in your descriptions with powerful, keyword-rich copy to uniquely explain your organization. On LinkedIn members can search for companies by keyword. Include words and phrases that describe your organization, expertise, and industry focus. Encourage Engagement – Your engagement on LinkedIn relies heavily on your network. (Are you sensing a theme here?) The easiest way to get your content shared with new people is to encourage participation from your team. Challenge your staff to “like”, comment and share your organization’s posts. When they do this, their individual networks are then able to view and engage with your content. This is vital to growing your following! We have a weekly social media challenge among our TCG team. Everyone is asked to post one time a week and link our company. We do this to hold our team accountable to helping grow our organization’s online presence, while also having clear, simple expectations. It’s easy to get sucked into social media. This allows for healthy boundaries that keep everyone on task! Share Content Regularly – Plan to post on LinkedIn organization page 3-5 times per week. Consistent posting encourages engagement. Updates posted in the morning usually earn the highest engagement. Experiment with Ads – As with most social media platforms, LinkedIn ads are low cost and can open doors for new clients, donors, etc. LinkedIn offers different options for their campaigns. You can target a specific audience to promote content, create actual ads that will pop up viewers’ homepage, or send target messages directly to people outside of your network. As with any advertisement, use engaging, colorful language and visuals that are specifically geared toward your audience. If you’re going to spend money, make sure there is a clear call to action in your ad so you can easily track your return on investment. Track Progress – LinkedIn has free analytic tools for tracking engagement. You’ll find this tab in the top left corner. This tool will help you track what content your followers are engaging with, demographics of your visitors, best times to post, etc. We pull a monthly report from this tool to ensure that our efforts on LinkedIn are working and identify areas we can improve our approach. We believe social media is a great method for telling your organization’s story. At TCG, we want to help you accelerate your impact – whether that’s with your marketing efforts or through our other services. Contact us today and learn more! At Transform Consulting Group, we know how important it is to market your organization within the online world. That’s why we have so many blogs in our Marketing 101 series dedicated to your online presence (here and here). There are many online directories to look through. It can be confusing to determine which search engines to use. We know your time is valuable, so we created a list with our top six go-to directories, starting with the most popular, that you can use to promote your work! You have probably heard of or even used Google my Business. Google my business is free and is the “monster” of all search engines. Google logs an average of 7.8 billion searches per day – directing traffic to specific business pages. They have become the prime example of how search engines can help any company become successful. This is a Microsoft product, which means that Bing is the default search engine for most Windows desktop and tablet versions. It allows anyone to add multiple business locations, photos, videos, and more. Bing has an easy, fast, and free registration for anyone to use and add their business. Yahoo’s service draws millions of searches every day. It allows anyone to post a basic listing for free. You can choose to pay a minimal free to add more detail and photos within your organization description (but we have had success with the free version!). There is a smaller fee in order to add and more description and a larger fee in if you want your organization to be listed in more than 40 directories. The basic listing is just as sufficient because the most important thing is getting the name out there for the public to see. Yelp is one of the best, free engines for honest consumer reviews. Small businesses might not think to use Yelp because it is popular for restaurants and hotels, but it is also a great source for advertising small nonprofits. Yelp stands out from the others because it allows organizations to connect with their clients and/or stakeholders and send them messages for more in depth advertising. They have a unique reporting tool to gain reviews of the best business trends. MerchantCircle is a free network that focuses on small business connecting with local customers and other small businesses in the same area. Users can boost their listings, post their own blogs, and take advantage of other marketing tools aimed at making their business stronger. Yes, it is true, the Yellow Pages are still an efficient way to advertise a business. It has become a well-organized, online version of the classic search guide. Along with marketing, TCG appreciates good data that can help make a company stronger. Yellow Pages has become the best network that offers detailed ad performance data. The downside to yellow pages, is the fee. The fee can become high depending on the size of the advertisement. This would be something to consider when advertising a business through Yellow Pages. Learn more about the price breakdown here. Not only is it important to have your organization listed, but what information you include in your profile is vital! Make sure to fill in all fields with updated information about your business, so that it is accurate and easy for consumers to learn more about your organization. At TCG, we’re excited about the causes you support and the work you do in your communities. 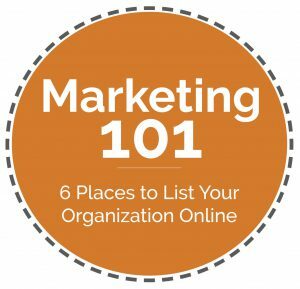 Can we help you position your organization better online? Contact us today to learn more! 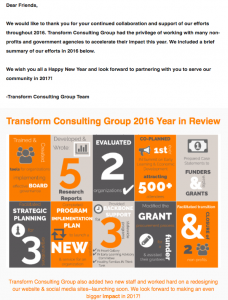 At Transform Consulting Group, we see many organizations launch services and programs in response to an obvious need in the community or a gap to address. Your organization is getting into your work, because you have a passion for a cause. Too often nonprofits spend their time on making their programs and services amazing and not as much time on their marketing efforts. We don’t expect you to be a marketing genius. We want to equip you with simple tools, so that you can do what you do best and it starts with your marketing. 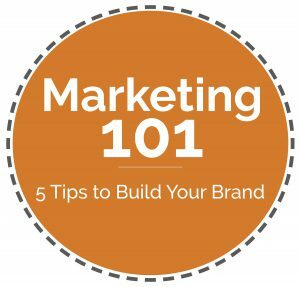 We launched our Marketing 101 series with 5 Tips for Building Your Brand. In this blog we are focusing on your social media presence and will provide simple tips you can immediately implement with little time, budget or resources. First, you may be wondering why invest time in social media? Social media is continuing to grow everyday – with over 69% of adults now using some sort of social media platform. It is a simple, low-cost way to promote your organization. There are numerous social media platforms you can decide to utilize for your nonprofit. We understand your time is limited and recommend choosing 1 or 2 social media platforms to get started. There is no reason to spend time on every available social media site and stretch yourself too thin. By choosing 1 or 2 platforms, you can spend the necessary time making sure your efforts get the biggest bang. There is a little science to choosing what social media platform to invest in, and it really depends on your audience and message. However, we suggest at least starting with Facebook. Facebook is the largest platform, with over 1 billion users daily. Other options to consider are Twitter, LinkedIn, Pinterest, Instagram, and the list goes on. Regardless of your chosen platform, these best practices can be implemented! Your followers need to hear from you on a consistent basis. Your posting schedule will vary depending on your social media platform. On Facebook, you should post at least one time a day. Twitter operates at a much faster pace and if you truly want your content viewed then you will need to post 3-5 times a day. On sites like LinkedIn, you may find that posting 3-5 times a week is most appropriate for your audience. This may seem daunting at first which is why we recommend scheduling your posts when possible. On Facebook for example, you can schedule as many posts as you want for free by clicking on the blue box on your wall. There are also many tools available for scheduling posts on multiple social media sites. We use Hootsuite to schedule posts for Transform Consulting Group. Content shared by partners or other organizations in your network. On most social media platforms, there are built in analytics tools you can use for free. (Facebook calls these tools “Insights” and you’ll find the tab in the top banner. LinkedIn and Twitter have tabs called “Analytics”). Reach – This number tells you how many people are viewing your content or page. It also includes people who haven’t “followed” your page, but can see your content. Post Engagement – This number shows how often people are “liking” or “sharing” your content. By scrolling to the bottom of the “Insight” page, you can see the engagement on every post and use this information to determine the types of posts your audience is interested in. People (found on the left side of the screen, under “Insights”) – This tab shows basic demographic data about the people who “like” your page. 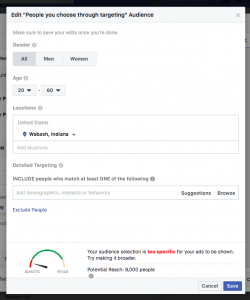 Determine the gender, age, and location of your target audience. Are those the same people who are viewing your content? If not, you may need to change up the things you are posting to attract the demographic you want to engage. When Your Fans are Online (click on “Insights” and “Posts” on the left side of the screen) – This data will show you what days of the week and time of day your fans are online. This is valuable information as you start scheduling posts. Use this data to determine when you should post to ensure the most eyes see your content. Photos and videos perform better on all social media platforms. Avoid posts that just include text, but instead upload images or videos that capture your fans’ attention. Always make sure to include a photo when posting links to articles or a page on your website. We have had good luck with Facebook Ads for as little as $10 per post for our client the Indiana Heart Gallery. The Indiana Heart Gallery has great engagement with followers on social media, but we wanted to target individuals who don’t already know about the Heart Gallery for our major events. The advantage of utilizing ads is that your content will reach people who aren’t already engaged with your page. 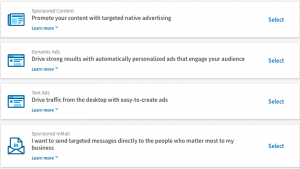 Whatever platform you utilize for ads, make sure you are specific about your target audience. Most platforms allow you to choose specific demographics, location, etc. of the people you want to target. Spend time making sure your content is appealing to the same target audience you are targeting with your ad. Respond quickly to messages, retweet partners’ post, share content, “like” comments on your wall, etc. The more you engage, the more often your company will pop up in people’s newsfeed! At TCG, we are passionate about helping you move your mission forward. Are you interested in partnering? Contact us today and learn more! We’re kicking off a Marketing 101 blog series to help set up your organization with the right tools to clearly communicate who you are and what you do in the community. It doesn’t matter how great your programs are or the incredible services your offer, if no one knows about your great work. Your efforts will fall short every time. We know many of you do important work in your communities. You are working to reduce homelessness, reduce hunger, improve health outcomes, improve student attainment, get more students to and through college, help find permanent homes for children in foster care, and the list goes on. At TCG, we are here to help you accelerate your impact and often that starts by laying a foundation with simple marketing strategies. This series will offer you practical tips to market your organization using little time and resources. By taking these steps, you could see an increase in your enrollment, development of new partnerships, increase in funding from individual donors and philanthropic funders, and improvement in your public image. First, we’ll start with building your brand. This will be the foundation for all other marketing strategies moving forward. What is an organization’s brand? A brand is your logo, website, tagline, color scheme, etc. It reflects your employees, your culture and your services. A brand is all these things and more. A brand is what makes you you. Think back to why your organization first formed and developed your programs and services. There was a compelling need in your community, and your organization formed to meet that need. You saw a gap in the services and an opportunity to make a difference. Your brand should communicate this. What is my organization’s mission? What are the benefits of our services? What makes my organization unique? What does the public think of my organization? What qualities do I want people to associate with my organization? This requires some soul searching and research. Learn the needs of your community, the habits of your current and potential clients. Talk with your team to determine how they feel and think about your organization. Once you can answer the questions above, you’ll have a better idea of your next steps and can move on down this list. Your logo needs to incorporate tip #1 and should communicate who you are as an organization. This can be simple, but it should also communicate some of the key messages about your brand. Once you have a crisp image that truly reflects your organization and mission, PUT IT EVERYWHERE. This logo should be included in all your communication efforts. It should be featured throughout your website, your social media platforms, collateral materials, staff email signatures, building signage, etc. We’re visual people and while the public may not be able to recite your entire mission statement, they should be able to connect your logo with your brand. Our team recently led a training in partnership with the United Way of Central Indiana about being results-driven. Day two of our training focused on how we use the data we collect to tell our story and improve our results. The participants brought in their various collateral material to share and review how they use data to tell their story in their brochures, program flyers, annual reports, postcards and other places. One organization had about 6-10 different pieces about their organization, and each one looked different. There was not a unifying look across the marketing material. This should be short and sweet, but memorable. You want your tagline to be true to who you are (again go back to tip #1), but you also want it to catch attention. Your tagline should help people remember you. We don’t always have much time to capture the public’s attention, so we want taglines full of punch and dynamic to draw in potential clients, donors, and partners before they mentally check out. Your tagline is what makes people come to you! If you’re getting stuck on this step, click here for more tips or here for a free tagline generator that can help get your wheels turning. Once you have your tagline, use it! Put it on your company’s business cards, on your website, in your marketing materials, email signature, office walls and other visual locations. Our company’s tagline is “Accelerating your impact”. It is three words and easy for our team, clients and partners to remember. It also emphasizes our mission and purpose. An elevator pitch or speech is a short overview of your business or services and can be helpful when doing face-to-face networking. It’s a powerful tool that your entire team should have in their tool belt. This is meant to be short, hence the name. It’s something that could be spouted out during your average elevator ride. It should include who you are, the change you are wanting to improve, who you serve, and what makes you unique. It should also include an action item. If you’re talking to a potential client then let them know their next steps in utilizing your services, or if you’re pitching a prospective donor make it clear how they can get involved. An elevator pitch is something you need to create and share with your entire team, so they are all saying the same message when they are representing your organization on and off the clock. Staff often attend community meetings or networking events. You want your staff, board members and volunteers to have a unifying message about your organization. Find more ideas here. Consistency, consistency, consistency. In this entire marketing series we will come back to this word, and it starts with your brand. If you want the public to have a clear understanding of who you are, then they need to be soaking in the same message every time. Everything from consistent colors, fonts, language, etc. needs to align across all areas of your brand. The more people hear and see the same consistent message, the more likely they are to start connecting the dots and remember who you are as an organization. There are many organizations who do this well. 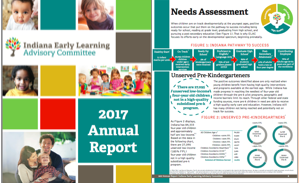 One example of an organization with a strong, consistent brand is our partner Early Learning Indiana (ELI). If you visit their website, you quickly see the organization’s mission and logo rather than having to scroll down the page or searching through pages of information. If you have ever received a newsletter from ELI you’ll notice the same things – consistent colors, tagline, language, etc. Jump over to the organization’s social media pages and you’ll recognize the consistency across all platforms. At TCG we want to help you move your mission forward—whether that’s behind the scenes performing research on new services, evaluating the impact of your services or marketing what you already have in place. Contact us today and learn more! Congratulations! You successfully gathered data to look deeper into the effectiveness of your programs, decided WHO you’re sharing the information with and now it’s time to figure out HOW to share the data. We talked about the different audiences you should share your data with in this blog, such as internally with staff and volunteers and externally with funders and partners. 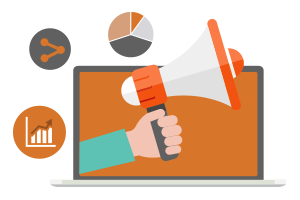 Once you determine your audience, you may decide on a variety of ways to communicate your latest information. First, it’s important to know your audience and be willing to shape your message in a way that is easy to understand and compelling. Some things to consider about your audience may include their age, educational background, industry or non-industry, and economic levels. For example, the way you communicate to a wealthy, influential donor should look different than the way you communicate to your staff or clients. Many of you are already regularly emailing your target audience, so consider using those email blasts to spotlight recent data. If your data shows positive results of a programs, then share it! Include photos or success stories from clients to highlight and make sure you’re presenting the facts in an “easy-to-read”, visual way. We did this at TCG and sent out a “Year in Review” email blast to current and potential clients highlighting our efforts and successes throughout the calendar year. If your data is showing huge successes, then you want to make sure EVERYONE hears about it! Brochures: Consider re-creating marketing materials to highlight specific results and outcomes beyond just the standard details about programs provided and “numbers served”. Email Signatures: Have all staff members update their email signatures to include a link to the Annual Report or another statement on a specific data point. The great thing about using marketing materials is that you are able to communicate data to people outside your circle. EVERYONE who receives an email or letter from you can see your data and it doesn’t have to be a person who already has a stake in your organization. Your data tells a story about your organization and social media platforms are great for sharing! Upload your Annual Report online and share the link often on your channels. Share pieces of data from the annual report on a weekly basis through a specific data point or graphic. Swap out your Facebook or Twitter banner to highlight a specific success. Make your social media posts visual! 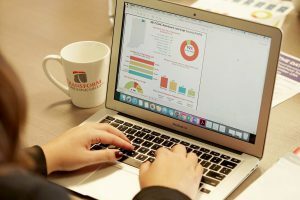 One tip to keep in mind: before you post long winded paragraphs packed full of numbers, try creating infographics to communicate the data in a visual way. You can then upload your infographics as photos on your social media channels and make it easy for your followers to share. 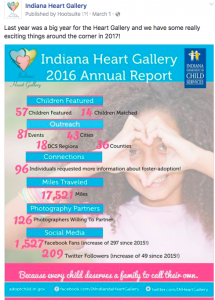 We did this recently when sharing 2016 stats for the Indiana Heart Gallery to our social media followers. While the infographic to the right doesn’t tell the whole story, it does gives a quick look at the numbers. For more tips on creating infographics, check out our past blogs here and here. It’s important to note that the examples listed above are just a starting point. The great thing about sharing data and telling your story is that the possibilities for HOW you do it are endless. Get creative and don’t be afraid to try out new things! Whether you’re at step one and need help gathering data or you already have great data compiled and need help sharing it, contact Transform Consulting Group today and we’d love to chat!